Hard to believe (for all my fellow US residents) Independence Day is just around the corner! And if there’s one thing there is sure to be no shortage of next week, it’s fireworks! That’s why I’ve decided to share a new, hand drawn clip art collection with that very theme today. 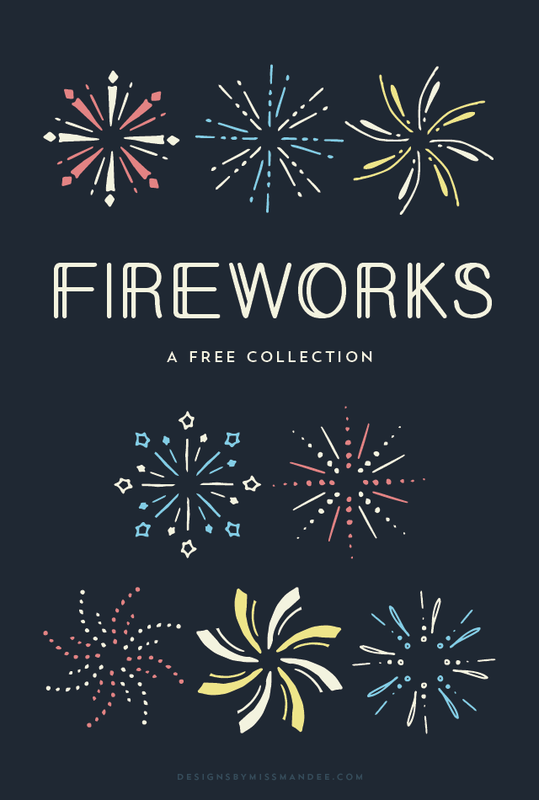 So, stake out your spot, set up some lawn chairs, and check out this explosive, 4th of July clip art collection! Everyone seems to have one particular firework show they go to as a tradition every year, but I never have. I think the reason for this is the location of my grandma’s house. My grandparents have always had a large portion of land within a not-so-rural area. Not only did this make for amazing night games and the best tree-climbing opportunities of all time, but it also made for great firework watching! Each year, from my grandparent’s property, you could view anywhere from 3-4 different firework shows simultaneously! So, most of my firework-watching memories consist of popping a big bowl of popcorn in Grandma’s Crazy Popper, hanging out with all the cousins, and moving from one spot of the yard to another as each show began. Good times! Now that arial fireworks are legal in Utah, I don’t feel a pressing need to fight the crowds to see an organized show—everyone in the neighborhood brings the entertainment right to us! After the kids go to bed, Isaac and I plan to pop some popcorn and sit on our roof to enjoy the show this year. Badda-bing, badda-BANG! Hope you enjoy my new 4th of July clip art! And have a safe and happy Independence Day! Thank you so much! This is just what I’m looking for.